If you're a current Luminar photographer, go to Check for Updates and walk through the few basic steps to install version 3.1. The process went smoothly for me. Once you have it, here are a few of the new features to try. New Accent AI 2.0 - The improved Accent AI filter lets you get natural-looking results in less time. New "human-aware" technology recognizes people in your photos and applies adjustments selectively for more realistic images. RAW+Jpeg Pairs - If you capture RAW and JPEG at the same time, it's even easier to stay organized in Luminar 3. When you import RAW and JPEG pairs, you can decide which files to see. View just RAW or just JPEG for a less cluttered library, or see both and use the JPEG file as a reference while you edit. Edits to JPEG and RAW files are independent but can be easily synced. Use the View menu to control which images are shown for a clutter-free library. Better Sorting - Are you using the Gallery view to get organized or search for that perfect image? Now when you sort using a method like File Type or Color Label, a second organization is also applied. When you sort your images they are presented by the new category first, and then automatically listed by date. Plus, there was a lot of work under the hood to improve performance. And there are some nice touches too such as a new progress bar to keep you informed during intense operations. 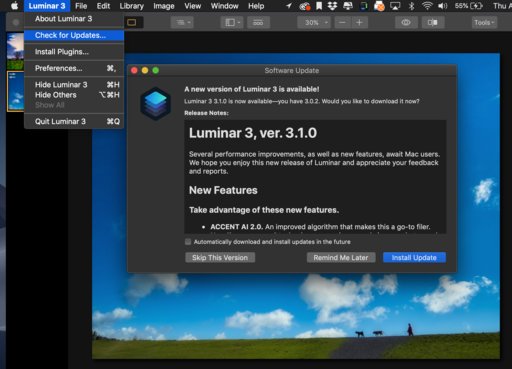 Luminar 3.1 is available today for both Mac and Windows platforms. This is The Digital Story Podcast #684, April 23, 2019. Today's theme is "How an Artist Evolves" I'm Derrick Story. On one level, evolution seems inherent in the artistic process. 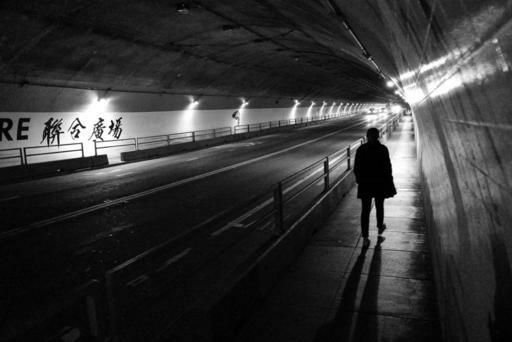 Creativity is both exploration and problem solving. This is all fine in theory, but what about the practical reality of being an artist in today's economy? How does work? In today's podcast I share my findings based on conversations with two creatives tackling this very topic. I hope you enjoy the show. I've been working on this project that I find fascinating, and I think you might find it interesting as well. I've started a new podcast called, The Nimble Photographer where I seek out artists who have redefined success and are willing to share their stories with me. My first conversation was with photographer Trey Ratcliff where he talked about failures vs successes. Then, I sat down with writer Ben Long, who had to reinvent his career after the crash of 2008. I have upcoming interviews scheduled with musicians, painters, and more, all touching on the topics of evolution and reinvention. First, I want to start with this thought by Trey, who addresses the notion of success vs. failure. I think he makes some good points here. Now, I want to jump over to Ben, who touches on the idea of doing what we love for a living, and where did that idea come from in the first place. If you're interested in learning insights from working artists who have managed to survive in this competitive environment, I would encourage you to subscribe to The Nimble Photographer Podcast. It's available on Apple Podcasts, Google Play Podcasts, Stitcher, and wherever you listen to your shows. My next interview should be live next week. In the meantime, you may want to check out to complete conversations with Trey and Ben. They're available right now. 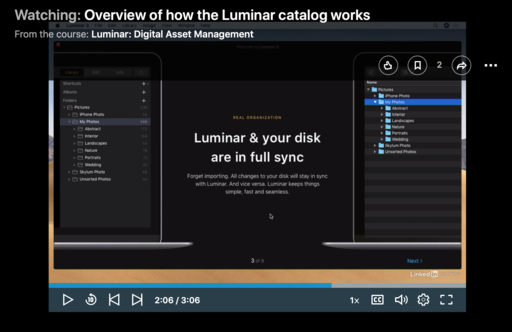 Check out my new training, Luminar: Digital Asset Management that is available on LinkedIn Learning and on lynda.com. Not only do I cover the library features, I provide a Quick Start chapter to get you up to speed in minutes, I show you the Magic Editing Filters in Luminar, and I explain how to use Luminar with other applications. Once you apply these tools to your images, you'll discover that you can enhance them in ways never before possible, especially so easily. I hope you have a chance to explore both my training and the Luminar application itself. It may change your photography. You can download a 30-day Luminar trial here. We still have a couple openings on the reserve list. You can secure your seat by visiting www.thenimblephotographer.com, and place a fully refundable deposit for the event. 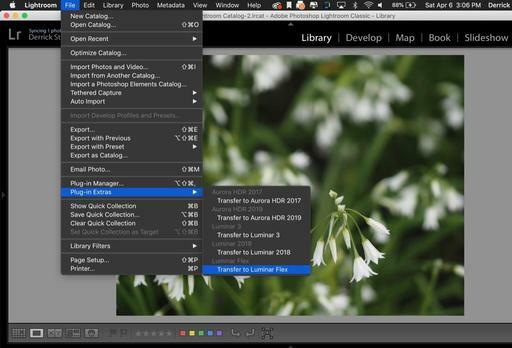 Luminar 3 with Libraries includes a cataloging feature that helps you organize your images. This is a helpful addition to this application that already does an amazing job enhancing your pictures. But you may be wondering, "Exactly, how does the library feature work?" If you have 3 minutes, I can give you a pretty good idea. Essentially, what you do is set up a watch folder. Every picture that you put in that folder becomes visible in the Luminar library. This is regardless if it is loose, or in another folder. When you first set up Luminar 3 with Libraries, Skylum recommends that you point the application to your Pictures folder. I'm not as keen on that as they are. Instead, I recommend that you create a specific folder for your Luminar catalog. This gives you more control as you learn the application. Take a look at the video. I walk you through the setup screens for Luminar 3 with Libraries. It is from my new training, Luminar: Digital Asset Management that is available on LinkedIn Learning and on lynda.com. 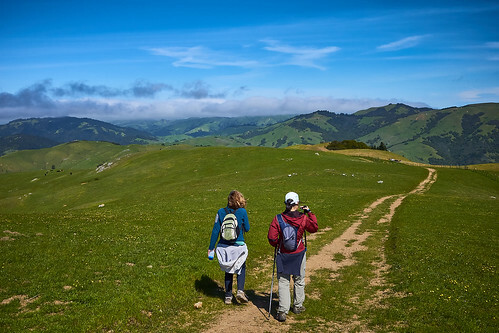 The blustery Spring weather in Northern California was perfect for a Sunday day hike. Normally, I would slip the Fujifilm XF10 into my cargo shorts pocket because of its excellent color rendition. But since I have the equally svelt Ricoh GR III on loan, I packed it instead. It did not disappoint. Big Rock Trailhead - Ricoh GR III. Photo by Derrick Story. One of the challenges of springtime hiking is that I'm not in my best outdoor shape after the wet winter. So climbing those hills with as little gear as possible is important. For this 5 mile hike with 1,100' elevation gain, I brought the Ricoh, a water bottle, and my iPhone X. Other than what I was actually wearing, that was it. And I have to say that climbing those hills was much more enjoyable as a result. Hiking on the Ridge - Ricoh GR III. Photo by Derrick Story. In addition to its APS-C sensor, and excellent 28mm lens (equivalent), the GR III produces excellent DNG files with good color. I mention the DNG files on purpose. I shot RAW+Jpeg on this hike, and it was clear that the DNG files looked much better in Capture One Pro 12 than the corresponding Jpegs. 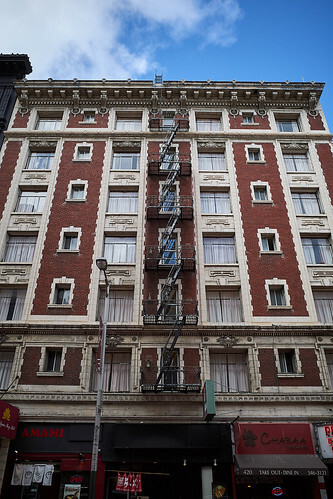 The RAW files had better color and tonal gradation. A lot of times I don't really start to notice a difference between RAW and Jpeg until editing. 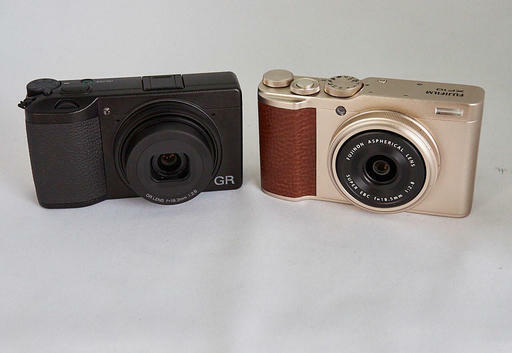 But in the case of the GR III, there was quite a distinction between the two even at the thumbnail phase. The upshot of this is interesting to me. Because for urban shooting, I really love the Jpegs in the various monochrome modes available on the GR III. They are just beautiful. But for color work, I very much prefer the DNG files, at least those processing in Capture One Pro, to the Jpegs. 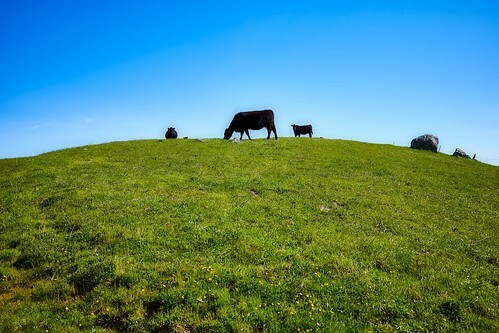 Cattle on the Ridge - Ricoh GR III. 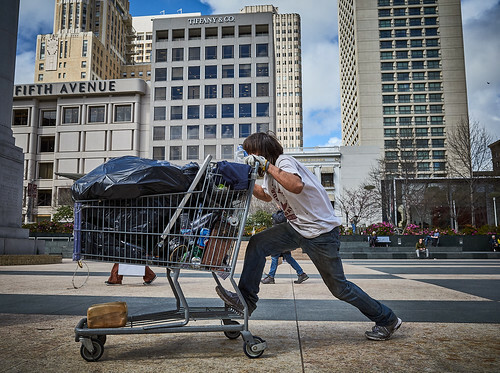 Photo by Derrick Story. 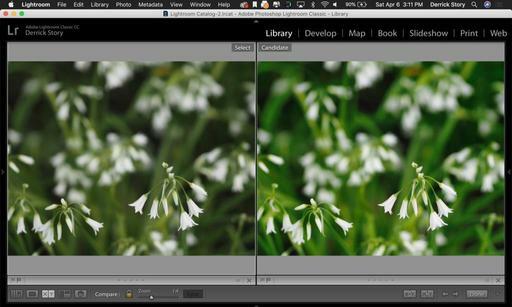 After process the RAWs in Capture One Pro 12, I did a little finishing work on a couple of the images with Luminar Flex. I particularly like warming up the tones a bit with the Golden Hour filter, then adding a dash of secret sauce with the Orton Effect adjustment. The bottom line, I was pleased with the images that I created with the Ricoh GR III on this hike. And I throughly enjoyed my workout as well, staying nimble with this little guy not slowing me down at all. You can squeeze every drop of quality from your optics in Capture One Pro 12 by tapping the Lens Correction panel before editing your shot. Here you can enable profiles for your optics, adjust distortion, reduce light falloff, and even correct for diffraction. 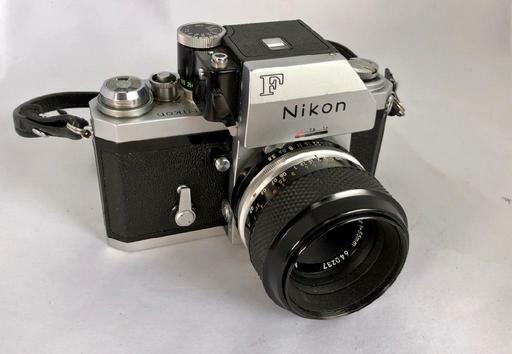 Combine this capability with a good RAW file, and you can enjoy amazing image quality as a result. In this 4-minute video, I walk you through the steps for maximizing optical performance in Capture One Pro 12. This is from my essential training on LinkedIn Learning and lynda.com. I don't apply Diffraction Correction to every image, only those where I think it's appropriate or can improve an important photograph. It does use extra processing power, so I save it for those pictures that really count. Photographers who want to use the latest image editing technology with their existing workflow may want to take a look at Luminar Flex ($70), that offers the power of Luminar 3 in a plugin format for Lightroom, Photoshop, Photos for macOS, and Aperture. Once installed, Luminar Flex is accessible via Plugins in Lightroom Classic. 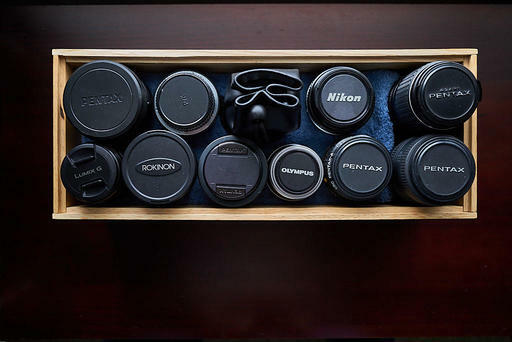 If you've worked with Luminar in the past, you'll feel right at home with Flex. It's essentially Luminar 3 without the organizer. (More on its strengths later.) As the two products continue to evolve, Flex with be the plugin version, and Luminar 3 will be the editor with the organizer, but without plugin functionality. Current registered users of Luminar 3 will receive Flex 1.0 for free. But up the road, they will be separate products. I've tested Flex with Photos for macOS and Lightroom. 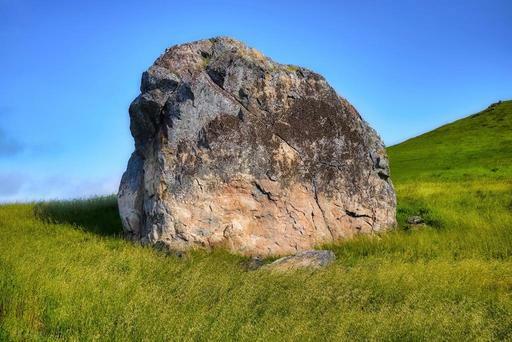 With Photos, it's an editing extension and very straightforward to use. With Lightroom Classic, the first step is to make sure the plugin is installed. Luminar will give you that option with you first launch Flex, which I did as a standalone app. (This was the only time I opened it as a standalone.) There's also an Install Plugins option in the top menu bar for Flex. Luminar Flex interface via Lightroom. 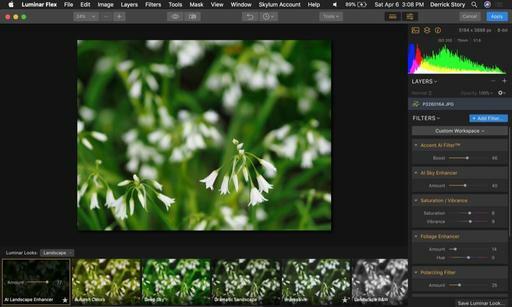 Click the Apply button in the upper right to return the edited photo to Lightroom. Next, load a Lightroom image in Luminar Flex. Now you can use all of its tools including, filters, looks (there are some new ones), and layers. When you have the image to your liking, click on the Apply button for the edited image to return to your Lightroom library. After that, you have both versions available: the original image and the Luminar-edited one. Two usage notes: First, my images always returned from Flex in the Tiff format, regardless of what settings I made in Lightroom preferences. I may be missing something somewhere, but I wanted to mention it in case you were having the same experience. And second, I noticed that my IPTC metadata was removed from the file upon return. This will definitely need to be fixed in an update. Images side-by-side in the Lightroom library - the original on the left and the returned image from Luminar Flex on the right. Up until this point, Luminar users have received some of these plugins as part of the overall package. So, if you're running Luminar 2018 or Luminar 3, you may already have this capability, depending on your host app. But if I understand Skylum correctly, this will change up the road. Luminar with Libraries will evolve as a standalone image editor and organizer. Luminar Flex will take a different path as an enhancement fine-tuned to existing workflows with Photoshop, Lightroom, Photos, and Aperture. New workspaces for designed for task-based workflows. Also, if you are a current Luminar user, and have downloaded additional Looks, you can use them with Flex as well. Looks that you made or used in Luminar 3 or Luminar 2018 are compatible with the new app. You can either reinstall your custom Looks packs in Flex, or manually copy items between the Luminar Looks folders. Luminar Flex is available now for $70 for new users and as a free download for registered Luminar 3 and Luminar 2018 photographers. (From Skylum: "All current customers will receive a free license to Luminar Flex Plugin. If you own Luminar 2018 or Luminar 3, you get a free version of Luminar Flex, just check the My Software section in your Skylum account.). My recommendation is that if you can download a free copy, do so and test it. If you haven't started using Luminar yet because you don't want to migrate away from your current workflow, Luminar Flex might be a good solution. I use Luminar with both Lightroom and Photos, and it really adds depth to my workflow. To be honest, I can do things in Luminar that I just can't with other applications. 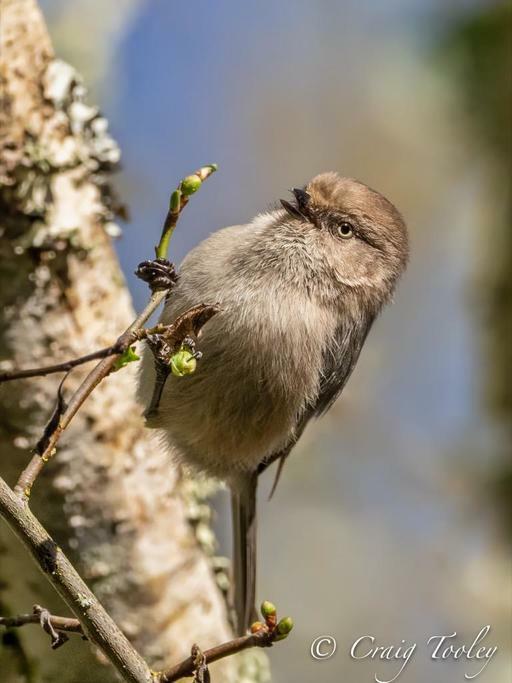 This is a guest post by Craig Tooley, nature and wildlife photographer, and TDS community member. I am primarily a nature/conservation/landscape, and occasionally an event photographer. And regardless of which of these hats that I'm wearing, I very much like the new Olympus OM-D E-M1X. Exposure time: 1/4th of a second, handheld. Yes, it's heavier than the previous Olympus models, but it's less than half the weight of my past Nikon D5, and over 10 ozs lighter than my D500. The ergonomics of the E-M1X feel quite natural. The button placement is well thought out, and they can be customized to accommodate a shooter's personal preferences (muscle memory). A word about the weather sealing. I'm not going to take it into a shower just to see if it's waterproof, but I have been known to slip while shooting tide-pools, and of course there are those occasional face-plants when skirting the edge of a stream. It's comforting to know that in these situations the camera is water resistant. Long, handheld exposure and GPS metadata. Also, the GPS is a welcome addition. I've gone through at least four external GPS units for my Nikons over the years. They've always been problematic. For the units that had their own batteries, I had to make sure they were charged before heading out to shoot. Another annoyance was accidentally bumping the cables that run from the GPS unit to the Nikon, often leading to data loss. And finally, forgetting to turn off the camera, then finding later (when needing to use it), that the GPS unit had drained the Nikon's battery. When the E-M1X goes to sleep, the built in GPS does as well. As a result, recently, when I grabbed my Olympus in the morning and realized I had left it powered on, I was relieved to find that most of the battery charge still remained. What a relief! Olympus 300mm f/4 with 1.4X tele-extender - handheld. So far, I've been using the "Continuous single or five-point tracking autofocus" for most of my wildlife work, and have found it to be very good. I've been experimenting with "intelligent subject," using "Airplanes mode" when shooting birds in flight. This works better than I expected. (But not good at all if the birds are in a brushy area.) The "multi selector" for moving the focus is well-placed and very responsive. Not to mention that I definitely appreciate the ability to handhold the equivalent of an 800mm lens at 1/60th of a sec. When I want to get the creative juices flowing, I enable the " Live ND filter". Now, working tripod-free, I find myself walking around looking for stuff that is moving in a static scene just to have an excuse to play with this feature. In some situations, the results may not be as good as a fixed glass ND filter, but "Fun" is definitely the operative word for the Live ND filter. The Olympus OM-D E-M1X may not be the perfect fit for everyone, but, I certainly don't have buyer's remorse. Meaning, there's no way I'm giving up this camera. 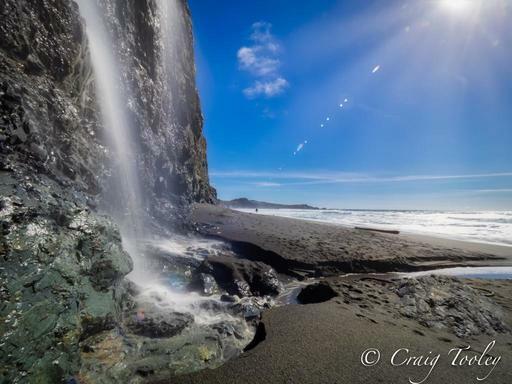 All photos are by Craig Tooley, captured with the E-M1X. 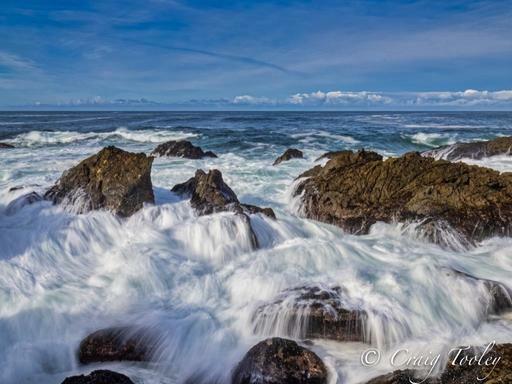 You can see more of Craig's work by visiting his site, RuffImages.